One of this elaborate library’s bookcases rotates out to reveal a hidden passage to the wife’s home office. Renoventures built this fun secret bookcase door in a weekend. It replaces their old basement door and makes the space much more useable. They have an illustrated DIY at their page here. Each section of this custom bookcase installation in an attic slides forward to allow access to unused storage space behind. We found this faux electric outlet wall safe on eBay. It appears to be for Australia and New Zealand, though we aren’t sure how real it works. 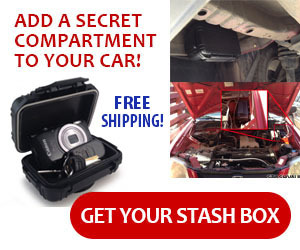 It mounts directly to the wall with screws or double backed tape and opens to reveal a secret stash compartment.